Do you work at Rasa Express? What did you think of Rasa Express? Thank you Rasa Express. I no longer have to wait forty minutes for my favourite meal! I didn't really hold high hopes for this place - fast Indian food should surely be oxymoronic but it's not - it's here and it tastes good. The dishes are slightly different as they are from the south of India but they are all the better for it. 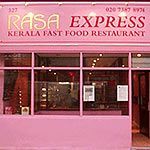 Even my Indian friend was impressed with Rasa Express - recommendation indeed. Very nice good home made food served all day. Dosas made fresh on the spot. Taste is very good. The aroma is nice.No complaints.